April 1988: S’Express was topping the charts with the theme to, well, S’Express. Liverpool were in the process of getting ‘their’ title back from Everton and Sandy Lyle had just become the first British winner of the US Open. Oh, and I had chosen the team I was going to support for the rest of my life. As I remember it, Dad was driving me back from a Heath End Wanderers U9 match where I had been playing in goal. My old man isn’t a football man at all. I’d go as far as saying he hates the game. But, to his eternal credit, he spent the early years of my massively unsuccessful goalkeeping career on the touchline having driven me all over the county. He even learned to run the line. Dad gently enquired who I supported ‘this week’ as I was in that phase of switching teams with alarming frequency – Manchester United, Liverpool, Everton and even Tottenham Hotspur had been my club if only for a couple of weeks. I seem to recall that I announced, somewhat indignantly as was my want – possibly still is my want – that I would support whoever was winning on TV when we got home. And I would support them for the rest of my life. We arrived home to see the final moments of Luton Town seeing off Oxford United in the 1988 Littlewoods Cup Semi Final. And that was it, I was Luton Town. Had I ever been to Luton? No. Was there a local team I could support? Aldershot, probably and as I have grown older they are probably the second English result I look out for. But when you were a Surrey kid whose father was unlikely to take you to a game and gave you no guidance as to the rules of supporting a team you had to do it your own way. So I was Luton Town. Unsurprisingly, I was the only Luton Town fan in school and ‘we’ were going to Wembley. Actually, we were going to Wembley for the second time which was lucky really – the first time didn’t go too well as Second Division Reading tore us to pieces 4-1 with Micky Gilkes having the greatest 90 minutes of his life. As the Littlewoods Cup Final drew near, I was getting excited. I knew a lot about Luton Town already. Brian Stein had become my favourite player but I was also looking up to crazy Les Sealey, a goalkeeper who I began to model my own style on. Les’ style was basically to not shut up for a single second during a game of football and berate his defenders at every available opportunity. I have a feeling I managed to nail that quite quickly. Then the realisation dawned. Now, I cannot remember if it was a Scout camp or a football match I was playing in but I was going to miss the biggest match in Luton Town’s history. I needn’t worry too much though, my late mother told me. She was going to record it for me so I could watch it the minute I returned home. And considering my mum was capable of recording Neighbours for me each day so I didn’t have to wait for the repeat (was the repeat at 0935 or 1735 in 1988? I can’t remember) I had no reason to worry too much. I could just make sure I didn’t know the result – not that difficult to do back in 1988. Did she remember to record it? I won’t string this out. Did she balls. Does it still hurt? Yes, yes it does. But I have finally managed to watch the 90 minutes back. Leading up to the Wembley final there were many narratives. A good Cup Final has an obligation to provide such things and the 1988 Littlewoods Cup Final had them by the bucketful. Luton, as I have already mentioned, got past Oxford United in the last four whereas Arsenal had a far tougher test, seeing off the then-still-league champions Everton over two legs. Both sides were heading into the final hopelessly out of form. Arsenal had only won twice in their last nine games and Luton Town had managed one win in the last five – though that win had come on the Tuesday whilst the Arsenal players were sunning themselves in Spain. Luton’s big match temperament was being questioned in the media in the build-up. You could understand why. They had been smashed by Reading weeks earlier. They had lost in the FA Cup Semi Final to Wimbledon and had lost their two previous FA Cup Semi-Finals before that. Despite their talented squad, mainly assembled by David Pleat before he moved to Tottenham Hotspur, Luton did not have much to show for it. The new manager, Ray Harford, had selection dilemmas to contend with. Darren McDonough had picked up an injury in the week and was unavailable. Ricky Hill and David Preece were available but had not played much football at all due to recent injuries. Rob Johnson was another whose appearances had been limited due to a knee problem. And then there was Les. Les Sealey was finally ruled out at lunchtime on the day of the game. His place went to a 22-year-old with only six appearances that season. Andy Dibble’s last game was in the FA Cup Semi Final defeat to Wimbledon and now he was being thrown into the biggest game in Town’s history with minimal time to prepare. Harford chose to gamble on both Hill and Preece and also gave a start to young Northern Ireland winger, Kingsley Black. The man to miss out was the youngest of the three Stein brothers, Mark. His brother, Brian, was to pair big Mick Harford up-front but Mark took the news badly, leaving the team hotel upon hearing the decision and sleeping on his mum’s sofa – deciding not to play. However, minds were changed in time for Mark Stein to be named on the Luton Town bench with Ashley Grimes. Arsenal needed a replacement for the injured David O’Leary, their most experienced player. His shirt went to Gus Caesar, a player who has gone down in Arsenal history. Nigel Winterburn, possibly the Gunners most famous left-back, played at right-back – something which still looks odd today. 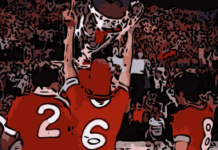 The two teams strolled out of the Wembley tunnel and I remember two vivid images. Firstly, Luton’s captain Steve Foster and his headband. Secondly, the blazer being worn by George Graham. If you were to ask people their memories of what both these men were known for wearing, it would have been what they were wearing that day. David Pleat was on co-commentary duties with Brian Moore and he commented, “Wembley has been a great arena for underdogs recently,” referring back to his Tottenham side being beaten by Coventry City the previous season in the 1987 FA Cup Final. David Pleat, incidentally, is one of the finest co-commentators England has ever had. Arsenal definitely started the game better and Andy Dibble was called into early action making a relatively simple save from Alan Smith. But, the ball stuck and it was an opportunity to settle any nerves. Then Luton started to play a little, some lovely interplay between Ricky Hill, the excellent Danny Wilson and David Preece. Luton were playing a 433 shape meaning they often had a spare man in the middle of the park. It was causing problems for the Arsenal who often needed David Rocastle and Kevin Richardson to tuck inside to even it up. Rocastle, however, was also required to provide cover to Nigel Winterburn and keep an eye on the talented Kingsley Black. In the heart of the Arsenal midfield was one of the most underrated English midfielders of the 1980s, Paul Davis. Another product of the Arsenal youth team, Davis had a lovely left foot. He never had his Micky Thomas moment, winning a title with the last kick of the season but make no mistake, Davis could have played for anyone in the world when he was on form. 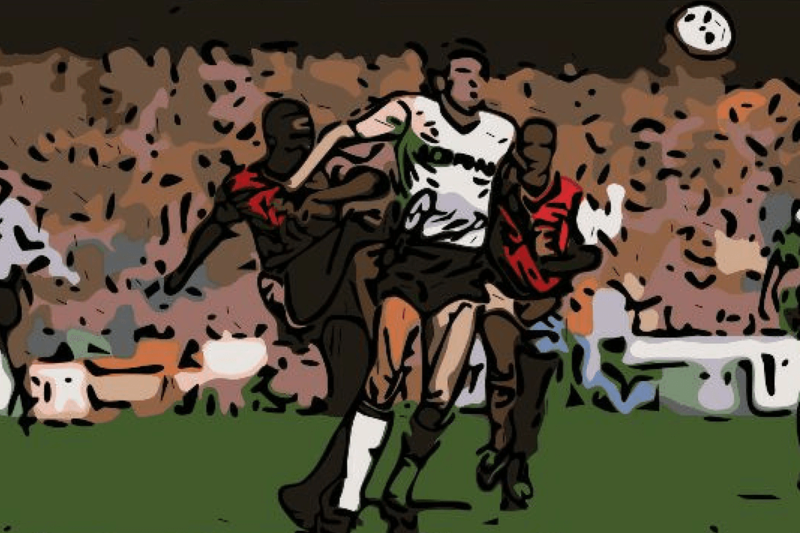 Luton had the first proper sight of goal and for all their continental passing they were also capable of playing to one of their main strengths – the aerial brutishness of Mick Harford. Harford had clearly identified Gus Caesar as a weak link in the Arsenal backline and was making sure the young Arsenal defender was not getting a moment to settle. Tim Breaker through a deep free-kick into the Arsenal area, drawing John Lukic from his line. This was the chance Harford loved, an opportunity to get a good run at the ball and the keeper. Harford got their first, made a decent contact with both but saw the ball land on the roof of the net. In the 14th minute, Luton Town took the lead from a similar situation. A free-kick was thrown into the box and Harford went up for the first ball with Tony Adams. A scramble followed and Steve Foster, perfectly capable with his feet, found Brian Stein suddenly in an acre of space in a crowded box. Stein calmly passed the ball past Lukic to open the scoring, a finish David Pleat likened to the ‘great Jimmy Greaves’. You would have expected this to shock Arsenal into action but it didn’t. Nigel Winterburn tested Dibble from distance but it was never enough to level the scores. The game started to get scrappy which, in its own way, was suiting Luton Town. For all their ability to pass the ball well, they also had a solid central defensive pair in Foster and Mal Donaghy. They were keeping Alan Smith and Perry Groves at arm’s length and managing the game well with Luton then looking to pick Arsenal off with quick breaks. Brian Stein, such an intelligent player, was drifting in from his right-hand spot and finding pockets of space behind the Arsenal midfield. The 40th minute came and we caught the first real glimpse of Gus Caesar’s ability to do something inexplicable. Under no pressure, Caesar looked to knock the ball out to the Arsenal left-back, England international Kenny Sansom. The ball sailed a could ten metres over Sansom’s head and into touch. Luton led by the single goal at the break and as far as a starter to the main course went, it wasn’t the best. To this point, we had not seen a lot of Kingsley Black on the Luton Town left. Yet, early in the second half, Black suddenly appeared in the game. Whether Rocastle had been instructed to focus more on attacking or not, Black had space to run at Winterburn. Black drifted past him and put a cross into Harford. 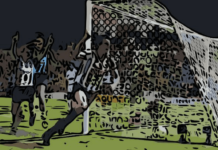 It came to nothing but Luton were buoyed and in the very next phase of play Harford got the chance to utterly bully Caesar to the floor and galloped down the left. His pull-back was met by Brian Stein, the ball just behind him in the air. The striker managed to get enough contact on the ball to turn it towards Lukic’s top corner. The giant Arsenal goalkeeper stretched to his left and somehow turned the ball over the bar, a truly stunning save but – as I go into in more detail on the podcast – not even in the top four saves of the match. Arsenal were on the ropes and George Graham knew he needed to make a change. Whilst Martin Hayes warmed up on the side and Perry Groves surely knew his nightmare was coming to an end, Tony Adams clattered Mick Harford from behind. Harford was not a man to go down injured easily, but he was down and had to be replaced ten minutes later. Hayes came on for Arsenal and had an immediate impact. Nobody had got the better of Steve Foster all day and with Hayes’ first two touches he left Foster for dead. The ball went left and a cross came into the far post. Alan Smith forced a superb top corner save from Andy Dibble – the first excellent save Dibble had been required to make. Smith was offside but Dibble was not to know this and the save lost none of its excellence due to the flag. Arsenal’s tails were now up and you just knew a goal had to come. And come it did. Brian Moore might have uttered with 25 minutes to go that “it’s not been a classic yet” but he was not to know what was about to happen. Five minutes later, Arsenal worked a clever free-kick. The ball was rolled to Davis who clipped a ball into the box. There was a mess and the ball fell to Martin Hayes. 1-1, Graham’s substitution had paid off. Just three minutes later, Smith finally had a clear sight on goal. His powerful shot beat Dibble, who looked aghast that the ball had gone in. Even watching the replays it looked like an excellent finish, but the Luton keeper was not happy. Luton, as a team, looked shot. The heavy legs were kicking in and their heads were down. Arsenal just needed to finish them off, to land the knockout blow. A couple of minutes later they had such a chance. Alan Smith met a cross, heading it back the way it came like we were all taught as kids, and Andy Dibble changed direction in an instant. He managed to get a good touch on the ball deflecting it on to the woodwork – and Hayes had the simple task of tapping the rebound home. He hit the post and the ball was cleared for a corner and then the realisation of what a world-class save had just been made dawned. There was no time to stand and admire it though as Luton were shipping chances in batches. The corner came in and Martin Hayes had a free header from six yards. Dibble, again, was more than equal tipping the ball over the bar in another moment of top-class goalkeeping. If Arsenal were to knockout Luton they needed to do better than this. In the next passage of play, Alan Smith was sent clear. He ran in 1v1 with Dibble and again the Welshman excelled with a fine stop. Surely Luton were realising they were still in this final? Maybe not, because just seconds later David Rocastle weaved his way into the area before taking the kind of tumble that, if you believe 90% of people, just didn’t happen in England before Sky gave clubs enough money to buy all those foreign superstars. David Rocastle, RIP, that was a cheeky little dive, wasn’t it? Nigel Winterburn, surprisingly, had the task of taking the penalty. Dibble stood tall, brimming over with confidence. Winterburn looked like his name had been pulled out of the hat. Even as a nine-year-old watching it back on the news, I could tell which way Winterburn was going to hit and fortunately for Luton, so did Andy Dibble. The penalty was saved and for me, it was the best penalty save ever made. The best penalty save ever made? Hear me out. This young man had been called up at lunchtime. His last game had been a heartbreaking defeat in the FA Cup Semi Final. Luton were on the ropes and there was only one man standing between the Gunners and the trophy. He had made three world-class saves and an excellent 1v1 stop in the last fifteen minutes. And then he saved the penalty. Now, of course, the penalty save would have long been forgotten had what happened next not actually happened. How often in life do a team miss a penalty only to concede seconds later? That is what happened here as Luton were energised, realising Arsenal didn’t seem to want to finish this game off. Gus Caesar, in a moment that has gone down in football history, randomly fell over in the Arsenal area. As quick as a flash, Kingsley Black was on the ball, He found Brian Stein who took two bites of the cherry. Neither went in, but the ball fell to Danny Wilson a yard out. Luton were level and there were eight minutes to go. We had to wait until the every last kick of the game to get a winner and it was for my new team Luton Town. Ashley Grimes, usually a left-back had come on as sub into midfield and found himself wide right with seconds remaining. His cross, either the outside of his left foot, found Brian Stein knowing all he had to do was get a decent contact on the ball. The ball went past John Lukic and Luton Town had finally won a game at Wembley. I thought I was on to a winner being a Luton Town fan. 6th (or something) in the First Division. Two Wembley appearances and an FA Cup Semi Final. Another Wembley final the following year. I was definitely on to a winner. Or, as history tells me, I wasn’t really. And I have finally forgiven my Mum for not recording the sodding thing.